Have you ever gotten nail enhancements, only to have them hurt for a day or two afterwards? Well then read on because this post is for you! There are two different ways to create an extended free edge when applying enhancements: Tips or Forms. Glue on nail tips are familiar to almost everyone, while very few people are familiar with nail forms and the resulting sculpted tips. Both can work well depending on your nail type, when applied properly. If you've been reading this blog for any length of time, you're probably catching on to that phrase by now. Applied Properly. It's what makes or breaks any great nail service. Today we're going to discuss tips and forms, the differences between the two, and proper application, so that when you go to get your nails done, you know what to look for. A nail tip is a piece of molded plastic that has a shallow well where it's glued onto your nail plate. Pictured to the left are two different kinds of tips. One has a full well that covers 1/3 of the nail plate, the other has a short well that only covers 1/8 of an inch along the free edge. Nail tips need to be sized properly to fit your natural nail, and this is where problems often arise. No tip should ever be pulled out of a box, sized against your nail, and glued on. They're not one size fits all, and each one needs to be altered for a custom fit. A good nail tech will check the fit of a tip to ensure it fits precisely from side-wall to side-wall on your nail (the side walls are the ridges of skin that run along the sides of your nail plate). If you fall between two of the available sizes (which, with only ten sizes available, most of the population seems to), she will select the larger size, and file the edges of the tip down to create a perfect fit. She will then thin out the well area of the tip with a file or buffer, before gluing it onto your nail plate. You should never have gobs of glue squeezing out from under and around the tip, and you should never feel an intense pressure on your nail plate after the tip has been glued on. Most nail tips have a pretty intense curvature to them, they're typically much more rounded than the average nail plate. 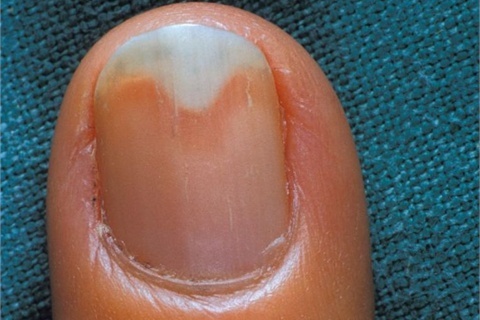 This causes a pressure point between the tip and your nail. The tip is trying to pull your nail to match its curve, and your nail plate, being firmly attached to your nail bed, doesn't want to go. If you've ever seen a spot like this: Onycholysis, on your nail after having your enhancements removed... Well, that's where the tip won the battle. The pressure between tip and nail can result in a slow, painful separation of your nail plate from the nail bed underneath. This is why many people have sore fingertips for awhile after having enhancements applied. Thinning the well area by filing it down, helps to give the tip more flexibility, and releases some of the pressure on your nail plate. Furthermore, a tip should be carefully filed after application, to make it blend seamlessly with your natural nail. This allows an even greater release of pressure from the tip, and it also keeps the tip from creating a weak point in the enhancement (have you ever noticed that your enhancements tend to break where the tip is attached to your nail?). If you have exceptionally large or flat nails, then tips are not for you because no amount of filing or beveling will allow them to fit properly. You'll want to find a nail technician who is willing to sculpt your enhancements on nail forms instead. Nail forms are, in essence, big stickers. They do make reusable ones, but most techs have switched to the more convenient disposable forms. Shown to the left are two different types of nail forms. The gold one is called a horseshoe (I only use these for masking off skin in messy nail art), and the silver is a CND performance form. This is just a small sample of the many types of forms out there, and each nail tech has their own favorites. No one form is better than any other, it all depends on what the nail tech is most comfortable and familiar with. To use a form, the nails are prepped for enhancements, then the form is slipped under the free edge of the natural nail, and wrapped back along the finger. The nails should be cleaned after the forms are applied to remove any oils that may have transferred from the techs skin onto your nail plate. The enhancement product is then placed onto the form to create a new, longer free edge. The trickiest thing about using a form is the placement. It must be placed snugly under the free edge, leaving minimal gaps, or preferably none at all. It takes some practice, but once a tech masters it, using a form is a lot quicker and easier than using a tip (there's no filing to custom fit the tip to the nail, and then blending to remove the seam). Additionally, there's no pressure on the nail plate with this method. The enhancement molds itself to the natural shape of your nail, instead of pulling at your nail plate to get it to conform to the contour of a tip. This results in a safer, more comfortable and natural feeling enhancement. Some people believe that tips are stronger than sculpted enhancements because there's an underlying structure under the free edge. However, that is completely false, and in fact, the opposite is true instead. Enhancement products are much stronger than the material used to make tips, and by gluing a tip onto the nail plate, you're actually creating a stress point that will crack and break more easily than the enhancement material would on its own. Personally, I use forms on just about everyone who sits at my table for enhancements. Having worn both types, I can say from experience that sculpted enhancements are much more comfortable. Though when a manicurist properly applies tips, they're not too bad either. If given a choice though, I'll always choose the sculpted nails.